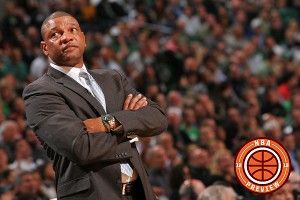 Examining the career arc of Doc Rivers. One of the odder things about this racket is the way that we journalists measure our own lives by the public lives of the people we cover. This is something common to everybody who makes a living reporting just about anything, but it is particularly acute for anyone who has made a living covering games. The phenomenon manifests itself in several ways. For example, there comes a time when all sportswriters realize that every athlete they cover is younger than they are. Then, you discover that every coach you’re covering is younger than you are. Then, finally, and this point grew sharper during the days of the high-tech — and, later, the Internet — boom of the past 30 years, you realize that every owner you cover is younger than you are. I suspect this same phenomenon occurs with political reporters and with people who cover the cop shop. It must cause something of an existential crisis to discover one fine morning that you’re older than everyone in the United States Senate and/or most of the people in the local mob. The other way it goes is that you track someone’s career for one reason or another until your accumulated experiences watching this player form a complete arc of memories within your own life. So it is with 51-year-old Glenn “Doc” Rivers and me, Rivers having agreed last May to coach the Boston Celtics for another five years, well past the shelf life of a good piece of the current roster, and certainly longer than I thought he’d be here. (There is an assumption among the basketball media wise guys that Rivers could walk away from his job tomorrow and right back into a lucrative gig doing television commentary.) I can track his career through things he’s done that have had an emotional impact, however transitory or silly, on my life as a basketball fan. We go back a long way. The first of these came in 1980, at a national high school tournament called the Boston Shootout. These were the relatively innocent days when AAU ball had not yet become the primary feeder road to a billion-dollar corporatized extravaganza called college basketball. The Shootout pitted teams from major cities against each other. Some were composed of genuine all-stars, almost pickup clubs chosen from a city’s best players. Others were loosely organized AAU-like squads whose various sugar daddies were obscure figures of dubious reputation. (One New York outfit was described to me by a prominent scout as being financed by a “shadowy Bolivian tin magnate,” which did not sound good at all.) The Shootout was a highlight of the Boston sports calendar, being a loose and funky context for seeing the upcoming generation of stars in college basketball, the identification of said stars having not yet become the behemoth it is today all on its own. In 1980, I was just starting out as a baby alternative journalist at the Boston Phoenix, where I was covering a lot of politics; as I recall, I had to work late on a story about George H.W. Bush on the first night of that year’s Shootout. The Phoenix sports editor came back to the office raving about this Rivers kid from Chicago, of whom I had heard only that he had committed to play at Marquette, where I had spent four profitable years of my life ostensibly learning about journalism, typing bowling agate for the local newspaper — a very respectable position in Milwaukee, pal — and making biweekly pilgrimages to the religious exercises held in the Milwaukee Arena by Al McGuire, he of sainted memory. This piqued my interest, so, having put Poppy to bed, I went up to the Shootout the following night and watched Rivers and the team from Chicago face off against a mouthy crew from New York. Rivers had pulled a muscle the night before and played the first half with his leg tightly wrapped, which restricted his mobility. Frankly, I didn’t see what all the fuss was about. Neither did the kids from New York. They waited for him outside the locker room at the end of halftime. Various 12-letter aspersions were cast. Slang for female naughty bits filled the air. Rivers went back into the locker room. He came out without the wrap. Then he proceeded to tear the New Yorkers several new apertures for themselves. He drove and dunked. He rained 3-pointers. He missed 3-pointers, went over their heads, and tip-dunked the rebounds. This occasioned a certain enthusiasm on my part. After one such play — I think it was one of the tip-dunks — the folding chair in which I was sitting flew backward and smashed to pieces against the hockey boards behind me. I distinctly remember promising to build my alma mater a new physics building, provided I could name it after this Rivers guy. (I egregiously reneged on this promise over the ensuing years.) It was a great night. A couple of years later, on a snowy Saturday afternoon in midwinter, I was sitting around my apartment in Jamaica Plain with very little to do and, being an alternative journalist as I still was, very little money with which to do it anyway. What I did know was that Marquette was playing Notre Dame in Milwaukee that afternoon. (College basketball still had not quite taken off, which you can tell by the fact that the game wasn’t on television in Boston then.) The rivalry was still hot back in those days, even though Al had retired five or six years earlier, but Digger Phelps was still coaching at Notre Dame and, frankly, if Digger Phelps had been coaching against the University of California at Hell, I would have shown up at the game in a red suit and carrying a pitchfork. As I sat in the apartment and watched the snow fall, contemplating my social life, which was also pretty much stuck in permafrost at that point, a friend called me from Milwaukee. The game was tied and in the final minutes. He put the receiver up to a radio so I could listen to the play-by-play. I heard through the gabble of secondhand static that Rivers had the ball and then a great, undifferentiated roar came through the phone. It was like that moment in Fail-Safe in which they know the nukes have detonated because of the way the phones screech as they melt. It took my friend a long few seconds to come back on the line and tell me that Rivers had flung the ball through from midcourt to win the game. I hung up the phone, went out onto the front porch of the three-decker in which I lived at the time, and let loose a yell in the general direction of West Roxbury that so alarmed the two elderly Irish sisters on the second floor that one of them came upstairs to find out if I was all right. I tracked Doc’s career through the rest of my own. I moved on from alternative journalism to tabloid sportswriting. Doc moved on from Marquette to the Atlanta Hawks, where I watched him play a fine playoff series in 1988, one that ended with the memorable fourth-quarter shootout between Larry Bird and Dominique Wilkins that lit up the old Garden. Doc had 16 points and 18 assists in that game before he fouled out. I ran into him at various points after that. Earlier that season, when the All-Star Game had been in Chicago, we talked about how his father, Grady, a Chicago cop, used to haunt the city’s blues clubs. Later still, when he was winding it up as a player in San Antonio, we double-teamed a friend of ours who’d gone to Dayton and who asked us if we’d like to go back and see that school hoist its NIT banner, and Doc explained that, at Marquette, we only raised ones for national championships. I even wrote about him when he took the job coaching the Celtics, and he talked about how rough things had been back in college when it was discovered that the woman he was dating, who would become his wife, was white, which is something I didn’t know, but which did not surprise me in the least. He won a championship, nearly won another, and now is facing down a rebuilding job not dissimilar to the one he took on in Orlando, when he first started developing his coaching chops. His star is a stubborn, occasionally recalcitrant point guard named Rajon Rondo, and their interpersonal dynamic is one of the most intriguing in the league. It’s unlike the relationship between, say, Mike Brown and Kobe Bryant, or between Erik Spoelstra and his two superstars, because the power in the relationship in Boston is far more evenly divided between coach and player, and also because both of these guys are uniquely articulate about what they perceive their relative places in the universe to be. This is the latest thing that has made the now-long career of Doc Rivers worth watching. I don’t break many chairs anymore, but I’d be lying if I said I weren’t fascinated by what comes next.